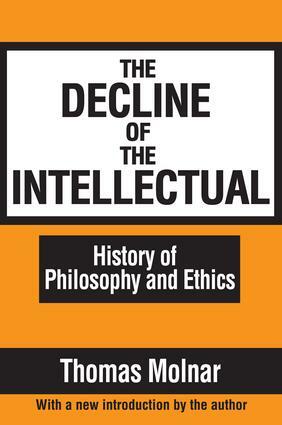 In perhaps his most famous book, The Decline of the Intellectual, Thomas Molnar launches into a fundamental critique of the intellectual class. He sees it as a group that had lost its way, collapsing a sense of vision into political activism, social engineering, and culture manipulation, and abandoning the writing, philosophizing, and scholarship that had occupied their predecessors. Universities began to produce factory-like, faceless citizens, as the job market became the arbiter of education and culture. Today's professors are recruited from this group of job seekers, and hence, have a shared indifference toward learning.Molnar likens present-day intellectuals to the earlier Marxists who elaborated their Utopian model in the Communist party. The campus intellectuals' objective is to transform the university into a replica and a laboratory of the ideal society. Colleges and universities thus become sources of propaganda of various political, financial, cultural, and ideological trends, not only among students, but professors as well. The thirty years separating editions have done nothing to weaken such a critical appraisal.In his new introduction, Molnar writes that the decline of intellectuals has extended outside of the campus to the arts, the public discourse, and the robotization caused by technology. On the initial publication of this work, Frank S. Meyer wrote in Modern Age, Thomas Molnar's book is not only true; it is intellectually exciting and it will remain a necessary handbook for anyone interested in the decisive problem of the 20th century. The Decline of the Intellectual is essential reading for sociologists, political scientists, educators, and university officials. It is the basis of present-day critiques of the academic world.